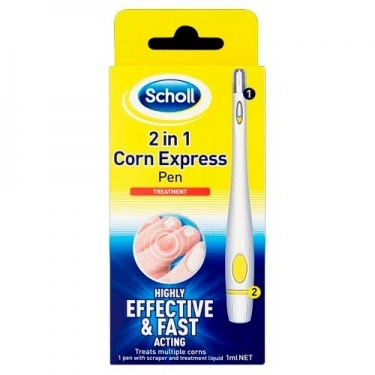 DESCRIPTION: 2in1 Corn Express Pen from Dr. Scholl is a care intended to remove the surface layer of the calli, softening them with a urea-based liquid. It is suitable for the calluses on the toes, the sole of the foot and the soft calli (between the fingers). Not suitable for neurovascular calluses. It is reusable and allows you to treat several calluses. Repeat every 3 days to encourage callus elimination.